The hardest decision you'll have to make is not whether to buy our soap, but rather what scents to choose. But no matter which ones you end up with, your skin will appreciate the high-quality ingredients included within every bar. Each handcrafted bar soap is made with ingredients such as palm, olive, soy, coconut, canola and rice bran oils, shea butter and fragrance. If you like exfoliants, we have some of those too...crushed grapeseed, cranberry seeds, lavender buds or mint leaves. If you prefer a more decorative soap (I know, our bar soaps are pretty decorative! ), our unique cleansing bars can be the talk of your party. 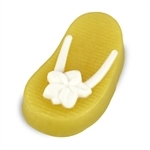 Choose from fish-in-a-bag, flip flops, tractors, rubber ducks, footballs, and many more. This luxurious fragrance is a mix of rare woods, spices and amber. The soap net works with Kreative Kraftwerks bar soaps to deliver an invigorating wash while keeping the soap intact and always within reach. The double mesh design produces a thick, cleansing lather and exfoliating, scrubbing action for a deeper, more refreshing clean. Sock Monkey Themed Duck Soap Kids will love this fish in a bag soap! Energy is a stimulating blend of citrus - including grapefruit, lemon and lime with hints of fresh cucumber and jasmine and a touch of pineapple, blackberry and champagne. Sandalwood Vanilla is an awesome blend of earthy sandalwood and sweet vanilla with musky, amber undertones. Sultry and romantic. Very strong and crisp, with just the right amount of tart. Sea salt, sea moss and green vetiver round out this fresh ocean fragrance. Blend of salt water, sand and suntan lotion. The aroma of a freshly blooming spring lilac bush. The warm, spicy fragrance of Kashmiri saffron from India masterfully blended with earthy woods. White cedar, Indian sandalwood, and patchouli are softened by mid notes of vanilla and sensual musk, then brightened by top notes of grapefruit and fresh bergamot. Very true herbal Lavender, incredibly strong. Tropical mango and guava are wrapped with green melon and juicy pineapple. A fresh and intriguing blend of agave, sea kelp, ocean breeze, citrus zests, sparkling bergamot, dewy cyclamen and soothing sandalwood. Crunchy granola blended with fresh oats, golden honey and vanilla bean. Raspberry, Peach, Lemon & Strawberry on a bed of flowers and musks. The perfect primitive scent! Woodsy notes mingle with succulent red berries for a real rustic aroma! This adorable soap is scented in Sugar Plum. Approximate weight of each bar is 5.7 oz. This fantastically fruity blend is a whirlwind of succulent peaches, fresh appless, and juicy berries. A combination of pine sap, cranberries, spices, mistletoe and a crackling fireplace! A sophisticated spiced apple cider blend. A refreshing blast of unique herbal fusion!